Giftster.com, the place to share gift ideas with family and close friends, goes live with several most- requested new features, including gift preference profiles, giftster reminder postcards, public list settings and enhanced member search. Giftster works well for wish lists among family, now with public lists I can use it for event based occasions like baby showers or a wedding registry too. Giftster, the service that is pioneering the idea that everyone has a permanent, personal gift registry on the internet, today announced several new features to further that goal. When a giftster member is on the way out the door and wondering what shoe size her granddaughter wears, the new giftster gift preference profile can help. The feature provides a permanent place to list clothing sizes, colors and interest preferences to help guide others as they purchase gifts. For a fun and exciting way to know someone's thinking of you, the new giftster reminder postcard tips off the owner of a wish list that someone is shopping for them. The new giftster reminder system provides one-click anonymous email messages to the giftster member(s) of their choice to remind them to update their gift wish lists or preferences. The new giftster public lists enable list sharing with wider audiences. 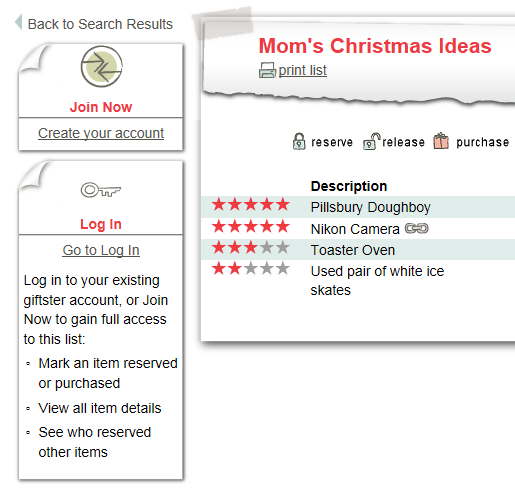 Members choose whether their wish lists are viewed only by family or friends, or publicly viewed by anyone visiting giftster.com. This new public list feature, along with the newly enhanced giftster member search makes it easy to find members, preferences and lists even without a giftster membership – a feature invaluable for baby showers and wedding gift registries. Giftster is a free, online and mobile service to connect family and close friends around gift giving occasions. Set it up once and use it for a lifetime. Giftster is the go-to place for gift ideas and guidance ahead of birthdays, holidays, and other gift giving occasions. Giftster users can set up groups, and view and reserve items on wish lists. Unlike most gift registries, giftster allows members to build lists and preferences any way they like, adding ideas from any store or source – both online and offline. Gift registry and wish list items and status automatically synchronize in real time across the giftster.com website and the mobile versions for Android, iPhone, iTouch and iPad. Minneapolis-based MyGiftster Corporation was founded in 2008. Additional screen shots and artwork are located on the giftster press page.